Happy Halloween! In keeping with the spirit of the holiday, we’re going to be talking about one of the most magical minerals of all: salt. 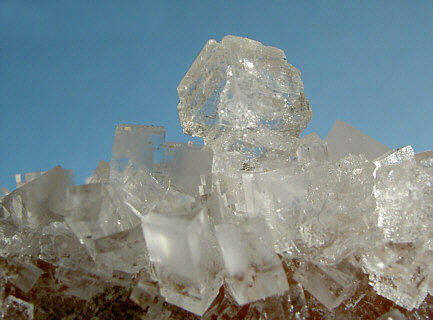 Salt (NaCl, or halite) has been a highly prized mineral for millennia. But, under the traditional definition of a mineral, salt, like ice, can only be classified as a mineral if hasn’t been manufactured. Remember, a mineral is a naturally occurring, homogeneous solid, with a predictable crystalline/chemical structure and physical properties *. But whether natural or man-made, people have been using salt for years — not because it looked pretty, or helped with industry, but because it was the original food preservative. Nowadays, preservatives are thought to be bad, but that’s just because we have these things called refrigerators. Before we had the equivalent of an easily accessible ice cave in every home, salt was the go-to mineral for keeping your family and village fed through inclement weather and on long journeys. Why? In large enough concentrations, salt inhibits microbial growth, including species that spoil food. Salt doesn’t necessarily eliminate bacteria, but it can prevent bacteria from growing into large populations. Salt’s excellence at preserving food from rot and spoilage led many cultures around the world to ascribe magical properties to the substance. It became a sign of purity, used to bless infants and sanctify religious rituals around the globe. It was found buried in Egyptian tombs, and is used in Shinto purification rituals. Because of its association with food and longevity, salt was thought to ward against evil and demonic spirits. The superstition of throwing salt over your shoulder has many interpretations, but some of the most popular involve throwing salt into the devil’s eye. A more modern salt superstition happened earlier this year in China. After the Fukushima disaster, Bloomberg reported that Chinese shoppers were hoarding salt. Presumably they thought that iodized salt could be a replacement for potassium iodide treatment. Given all the myths and folklore surrounding salt, it’s no surprise that it’s crept into our language, even as it had been slowly excised from our kitchens due to health concerns. A good person is ‘the salt of the earth,’ and you might have been introduced to skepticism when warned to take another’s word ‘with a grain of salt’…Can you think of others? Happy Halloween, and see you next week! * Like many definitions, this one is still up for debate, but more on that later…I’ve been getting a lot of requests for a Mineral Monday about pearls, which would be a perfect time to delve into the classic ‘what is a mineral?’ conundrum.